On the first day upon arrival in Nanjing, take up your quarters at a comfortable and economical hostel and get prepared. The Confucius Temple International Hostel located at the No. 68, Pingjiangfu Road, near the Pingjiangfu Bridge and the International Youth Hostel located at No. 7, Hequn New Village, Shanghai Road are our recommendations. On the second day, start your self-guided tour from Dr. Sun Yat-sen Mausoleum (admission fee: CNY80.00). Bus No. 9 or travel bus No. 1, No. 2 or No. 3 will take you directly there. Then use the same bus at Zhongshanling bus stop to proceed to the Presidential Palace (admission fee: CNY40.00). Continue to Nanjing Museum. You can take bus No. 80 from Daxinggong bus stop and get off at Jianye Road stop. The admission fee is CNY35.00 in the morning and CNY25.00 after 11:00 am in the afternoon. After 16:30 pm they will stop selling tickets and the museum closes at 17:00. After lunch, continue on to visit the Confucius Temple. Bus No. 4 takes you directly there. Stop at the Nanjing Yangtze River Bridge after that if time permits. Stay overnight at the hotel. On the third day, take the train from Nanjing to Yangzhou. The train takes about one and a half hours. 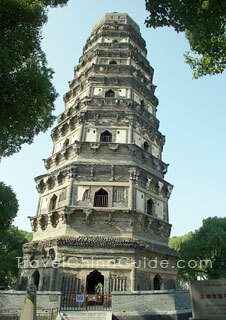 You can also take a bus to Yangzhou. Buss No.2, No. 10, No. 28, No. 45, No. 115, No. 136, No. 159, No. 165, No. 311 or No. 810 will each lead you directly to the Nanjing East Coach Station (Add: No. 17, Huayuan Road; Tel: 025-85477436). The coach fare is CNY31.00 for the general passenger's coach. There is also the Santana-type coach but at a higher charge of CNY51.00. The journey takes about one hour and 10 minutes. Upon arrival in Yangzhou, start your your tour with the Slender West Lake - the soul of natural beauty in Yangzhou located to the northwest of Yangzhou City. If you arrive by train, take bus No. 22, get off at Yuejin Bridge then transfer to bus No. 4 or U1 to the destination; if by coach, you can find the travel bus U1 outside of the station. The admission fee is CNY60.00 for low season and CNY90.00 for high season: open hours are from 06:30am to 17:15 pm daily. Then proceed to Guanyinshan. You can take the bus No. 5 and by 8 stops you will get there. The Daming Monastery is one more stop from Guanyinshan by the same bus No. 5. It is open from 07:45 to 17:00 The admission fee is CNY30.00 in low season (Dec to Feb, Jul to Aug) and CNY45.00 in high season(Mar to Jun, Sep to Nov). Enjoy your time there. For the night, stay at the Yangzhou Motel North Wenhe Road Hotel (Add: No. 52, North Wenhe Road; Tel: 0514-87939555) or Hanting Express (Yangzhou Wenchangge) (Add: No. 71, North Wenhe Road; Tel: 0514-87322399) since they are located near to Slender West Lake scenic spot and are very convenient for getting the Inter-city bus from Yangzhou to Zhenjiang the next day. On the fourth day, take the inter-city bus at Slender West Lake stop to Zhenjiang. Buses run every 20 minutes from 06:00 a.m. to 19:00 p.m. Get off to Jinshan Hill Park to visit the 1,500-year-old Jinshan Temple which is open from 6:00 a.m. to 18:00 p.m. The admission fee is CNY45.00. In the afternoon head for Jiao Hill. You can continue on by taking the inter-city bus from Yangzhou to Zhenjiang and in 5 stops get to termial - Jiaoshan Park (Admission fee:CNY50.00). Climb Jiao Hill and enjoy the scenery from here. Then take bus No. 4 to Zhenjiang railway station to bus a ticket to the adjacent city of Wuxi. The last train leaves at 21:40. Upon arrival in Wuxi, stay at a local hotel. The recommended one is Home Inn (Wuai Road)(Add: No. 81, Wuai Road; Tel: 0510-82760111) which is only 2.5 km from the railway station and is convenient for visiting the Li Garden, Xihui Park and Yuantouzhu Park. On the fifth day, a full day hiking tour to Li Garden, Xihui Park and Yuantouzhu Park. Firstly walk to Xihui Park since it is quite near - about 10 minutes on foot from Home Inn. May and June are the best times to visit Xihui Park(Admission fee: CNY45.00) when the cherry and azalea blossom out. Then proceed to Liyuan. You can take bus No. 71 or No. 98 to get off at Yinxiu Road and then connect to bus No. 20 or No. 82 to Liyuan in around 8 stops, where lies Li Lake which covers an area of 8.2 hectares. The Li Garden(through ticket: CNY45.00 including the yacht tour) is commermorated in the beautiful legend of ancient China of the love between Fanli (a prime minister of the Yue State in the Spring and Autumn Period (770 BC - 476 BC)) and Xishi (one of the Four Beauties in ancient China). They lived in this area after a big success achieved by Fanli. Then take s bus No. 1 to Yuantouzhou Park 3 stops from Liyuan. You can also walk there, should you have a map.The Yuantouzhu Park is a peninsula on the north shore of Taihu Lake in Wuxi city and is a main scenic spot of Taihu Lake. The admission fee is CNY 105 per ticket including the ship the fare of a boat ride. You can enjoy hiking around this area. Then return to your hotel for the night. On the sixth day, go to the railway station which is near to the Home Inn hotel to buy your ticket to Suzhou. Trains run every several minutes. Upon arrival in Suzhou, settle yourself down at a local hostel. The Suzhou International Youth Hotstel is a recommend one, which is well-located at No. 178 Xiangwang Road and the transportation is very convenient there. The room rate is CNY100.00 per night per bed for both single and double room. If 3 or more people share the room, it is only CNY45.00 per person per night. 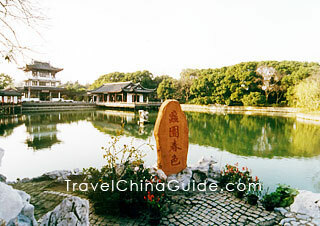 The hostel is adjacent to Shiquan Street, the Garden of the Master of the Nets and Suzhou University. You can visit these places and taste the local specialties nearby. On the seventh day, you walking tour follows the itinerary: Suzhou Museum - the Lion Grove Garden (Shizilin) - the Humble Administrator's Garden (Zhuozhengyuan) - the Folk Musume(Minsuguan) - the North Temple Pagoda (Beisita) - Guanqian Street. All the mentioned spots are in the same area with no more than 15 minutes switching from one place to another on foot. Travel bus U1, U2, U5 or bus No. 55, No. 178, No. 202, No. 301, No. 305, No. 529, No. 923, or others will take you to the Suzhou Musuem bus stop and there you can start your walking tour. The bus fare is CNY1.00 per ticket and CNY2.00 per ticket for an air-conditioned bus. On the eighth day, take travel bus U2, U5, bus No. 39, No. 47, No. 70, No. 305, No. 935 or No, 949 to Pan Gate, which is an ancient city gate with land and water entrances. Then take No. 70 to get off at Liuyuan Road to visit the Lingering Garden (Liu Garden). You will be on the bus for altogether 27 stops which maybe a bit tiring. So you can also take a taxi there. 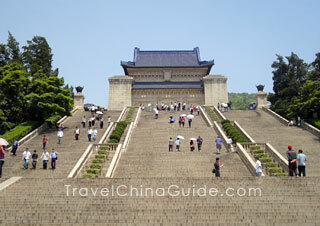 Proceed to Hanshan Temple (Cold Mountain Temple), which was once one of the 10 most famous temples in China. Zhang Ji, a famous Tang-dynasty poet, wrote the poem "A Night Mooring by Maple Bridge," which, consequently, made the temple even more popular nationwide. You can take bus No. 50 to the stop at Zhujiazhuang New Village and connect to Bus No. 300, No. 301, No. 307, No. 33, No. 415 or others to get off at Heshan Bridge. Return to your hostel in the afternoon. On the last day, you can stroll along some of the streets to explore the city and absorb the atmosphere of the city. Leave according to your schedule. Isightseeing tour bus in Nanjing? I will be in Shanghai for Conference, want to visit Nanjing for 1-2 days in July. I can't find any tours to join in U.S. all tours require minimum of 2 persons for booking and I can't find anone else to travel with me. How do I go to the attractions in Nanjing? Will local hotels have group tour information? Is Taxi an option to get around from one site to another? Are there tour buses available? how to get the information in order to plan my schedule? hi, taking taxi is very easy for traveling in Nanjing. You can take a train from Shanghai to Nanjing and travel independently there. Or you can book a tour with a local hotel or travel agent. 3-4 day stay in Nanjing, what to see, and where to stay? Hi. I plan to stay a few days in Nanjing, early pril 2016. Which area (or hotel) are recommendable for a single traveler? Hope to have some help to my Nanjing tour. I suggest you stay at Zhonggulou district and find a hotel near the subway. It is very convenient for you to go sightseeing on your own. As for what to see, you can choose what you are interested in the following: Confucius Temple (Fuzimiao), Xiaoling Mausoleum of Ming Dynasty, Dr. Sun Yat-sen's Mausoleum, Qinhuai River, Nanjing City Wall, Presidential Palace, Purple Mountain, etc. I will check the area closely. Any tips about some decent night life (live music and draft beer) in the same area?